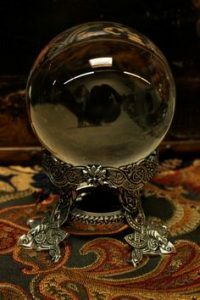 When we think of psychics and mediums we think of a crystal ball. 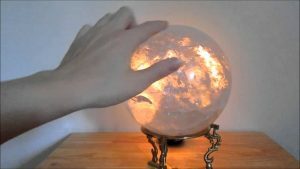 Have you ever wondered how to use a crystal ball? To use a crystal ball, you have to first choose one of your own. Real crystal balls are unique; no two are alike. You can find spheres of glass that have similar appearances. These are perfectly acceptable for scrying. Scrying is the type of reading obtained from a crystal ball. The glass sphere is acceptable but they aren’t as powerful as a reading from a crystal ball. A real crystal ball has cracks and inclusions and other impurities that enhances the beauty of the orb. The imperfections means that your ball is a true crystal. Quartz has impurities and imperfections. If you find a crystal ball that is truly clear, it probably has been treated or it can actually be glass. Do not be put off by a flawed crystal; it is the imperfections that will help you keep and observe the images you see. When you are choosing your ball, follow your instincts and select one that you feel a connection to. Take your time when selecting. One of the most common types of crystal in sphere form is made from clear quartz. This type of crystal naturally amplifies energy. This will help focus your own energy. Other types of crystal orbs can be selected for their purpose. Amethyst spheres are good when working with healing and love. Rose Quarts are good with self-esteem and family issues. The accuracy of a reading is not connected to the size of a crystal ball. It is the power of the ball, not the size and cost. Some readings may not even require a ball, a small seer stone can be used. The accuracy won’t be affected if the stone has a connection to the seer. 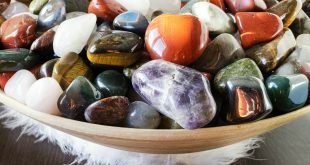 The first thing to know is that crystals retain energy, so you should start by cleansing your sphere. This can be done by visualizing your orb surrounded by light or by flames of violet as they transform the energy of your crystals. You should also vocalizing your intention. Surround yourself with light and call on the universe to help. The next thing to remember is that the space where you will be using to scry is as important as the stone itself. Make sure the space is cleansed and positive energy is in place. Speaking of places- You should set up in a quiet space where you are not likely to be interrupted. Soft music may increase the ambience and help you relax. Dim lighting will help you focus and help you see the images as they arise. You should start with a white candle so you aren’t having to work around the inherent energy of a colored candle. Scryers have often used sage or incense to help set the stage and the mood. You can chose whichever you like, depending on your preference. When you begin using your crystal ball, you will need to expect slow results. Any new talent will take time to develop. Don’t set your expectations too high and don’t be disappointed in the results. Don’t try to direct the reading. Hold your orb in your dominant hand or place the ball on a table that you can gaze at comfortably for an extended amount of time. Relax your mind and body . Say a small prayer or intention for your positiver energies. Close your eyes and open yourself up to what you see with your third eye. Breathe slowly and deeply and let go of any negative energy. Keep breathing and keep your mind clear. Focus on the area of a crystal that you are drawn to. Do not blink or look away. Keep your mind clear and relaxed. Ask the universe what you need to know. Keep focused as the images may appear in the minds eye, or in the crystal. You may feel some of the vibrations of the crystal. You can also try holding your sphere and tune yourself in to the energy of the crystal itself. It will be fun to see how you interact with that energy. You don’t need to interpret everything as the images appear; stay calm and be still as the door between you and the spirit world opens. When you interact with your orb, you should keep track of all of the feelings and sensations you feel as they come. A voice recorder is great way to do this without editing yourself. When you feel as if you have seen enough, allow your mind to relax and let you drift back to the physical plane. You will feel your energy shift. Let yourself refocus. Remember that you are just beginning a practice. It will take time to learn how to close out your thoughts and open up your spirt. Be patient and let your intuition guide you. It may take more than one session to start “seeing” things in the ball. Focus on the vibrations and images as you make your connections.